The mission of the GreatBrewers.com to bridge the gap between the world’s great brewers, distributors and the consumers who enjoy their products, with a paramount focus on education, on enhancing beer distribution practices, and on beer related social network aspects through the sharing of information. Through direct partnerships with world class beer wholesalers across the country and hundreds of exceptional breweries around the globe, the new GreatBrewers.com is making it easier than ever for beer fans to discover, learn about, and locate great beer via anytime (all the information is stored on Internet) and via any devices (e.g. any mobile device such as Android and iPhone). GreatBrewers.com distinguishes itself by providing brewers with a centralized forum to share the complete story behind their breweries, and each of their beers, with the world. 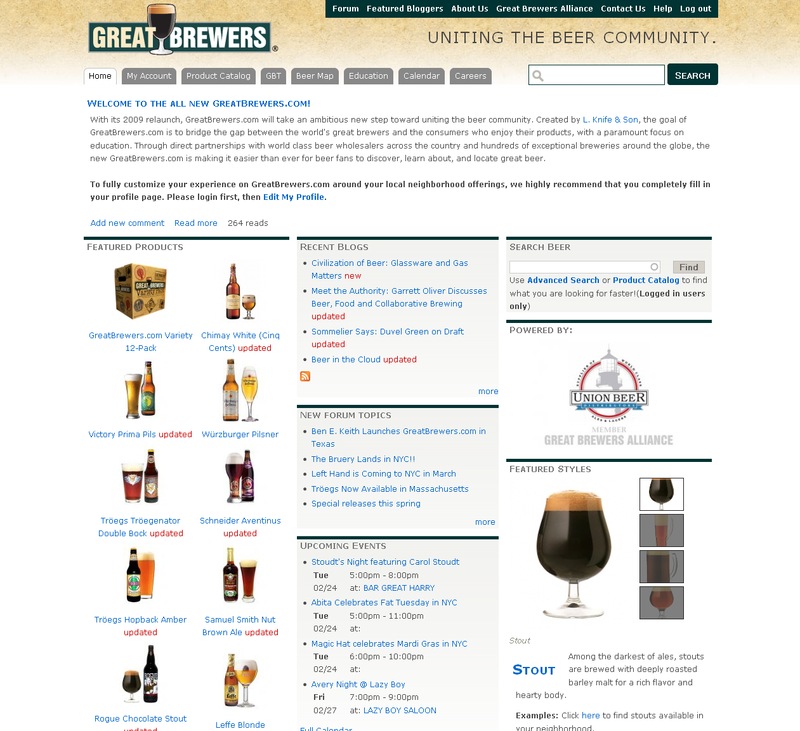 Further, due to its direct link with the databases of America's leading beer distributors, GreatBrewers.com offers the most accurate and updated information available on where to find specific beers. For the first time ever, beer fans can be perpetually updated on where their favorite beers are available, what beers their favorite brewers are producing, and what beers their favorite local bars, restaurants, and stores currently offer. Barcode For displaying product bar codes, and for later use on Android and iPhone. See details about this module at http://insready.com/node/39. BornFree For front page featured style showcase. Autocomplete Node Finder For front page product search. Email Field CCK email field, together with Spamspan to prevent Spam Bot Crawling. Hide submit button So, users won't click submit twice. Hierarchical Select We use Taxonomy for Beer Styles, Territories, Event Type, and more. Many of those Vocabulary has sub styles. HS Module improves the UI. Panels See the images attached (click to zoom in) to this documentation; that's how we used panels. Printer, e-mail and PDF versions We created one Content Type called Beer List, which simply inherits a normal node and plus Node Reference field. So, users can put a beer list together. They we use Printer, e-mail and PDF versions to print out this list or send it via emails. See an example at http://greatbrewers.com/node/45155. Views Many many things are built on Views. Product Catalog is one of them, but Views is too slow for Product Catalog, so re-engineering is necessary. Also, together with Node Reference, we can pull any data together. See more screen shots at the bottom of this page.